This section of the encyclopedia is for miscellaneous & unidentified glass. Some of these items we have no idea about, others we might have a good idea who the maker could be, but are not 100% sure. Some we may be able to identify, but don't yet have their own section in our encyclopedia. If anyone out there can confirm the manufacturer of any of the unidentified items, please let us know, then we can move them to the relevant section of the encyclopedia. Blenko American orange + yellow glass water bottle. Krosno Polish green glass jug, imported to UK by Jaffe Rose. Hooped glass vases in green, blue and smokey grey, with gold gilt bands, seen with labels that read 'Made in Romania'. Blue hooped glass jug with gold gilt bands, probably Romanian. Cloudy mottled cream glass bowl with orange band and polished ground pontil mark. Cloudy mottled orange glass posy bowl with bubbles. Blue + white cased glass vase with label that reads 'Veritable Opaline de Cristallin'. Pair of green glass tumblers with applied prunts. Purple textured glass handkerchief vase. 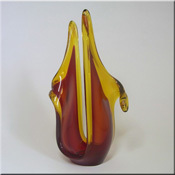 Amber cased glass vase with inner white casing and twisted ribbing. Bark textured blue glass vase. Amber textured glass candlestick holder. French St. Louis blue + clear glass bowl, acid stamped to base. Blue + amber ribbed glass bowl. Green + clear cased glass bowl. Amber + turquoise cased glass bowl. Uranium green striped glass carafe + tumbler set. Yellow + white striped glass tumbler. Spanish turquoise glass five spouted vase by Gordiola, very similar to a design by Venini. Spanish blue glass five spouted vase by Gordiola. Spanish green glass five spouted vase by Gordiola. 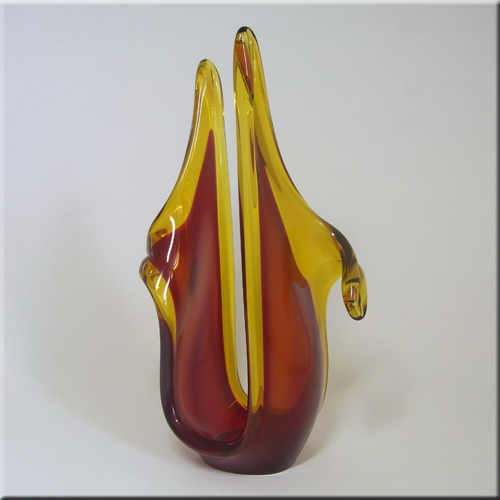 Amber glass vase/jug, probably by Gordiola of Spain. Val Saint Lambert Belgian pink glass bowl, signed to base. Val Saint Lambert Belgian clear glass vase, signed to base and labelled. British red + amber glass sculpture, by Davidson, labelled. 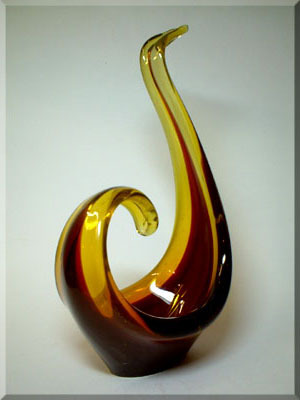 British red + amber glass sculpture, by Davidson. 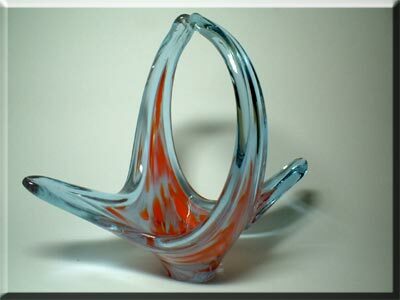 British red + blue glass sculpture, by Davidson. British blue glass sculpture, by Davidson. 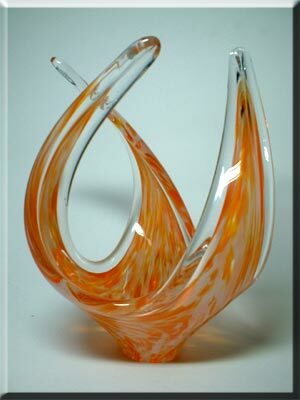 British speckled orange + clear glass sculpture, by Davidson. 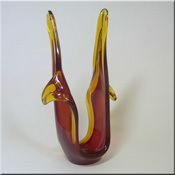 British red + amber glass sculptures, by Davidson. 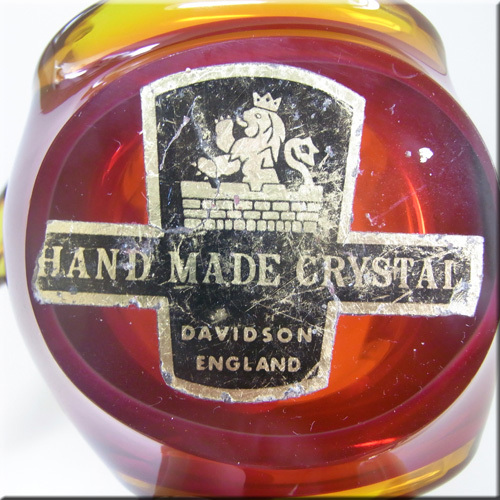 British speckled red + blue glass sculptures, by Davidson. 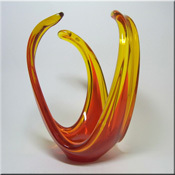 British red + amber glass sculptures, by Davidson. 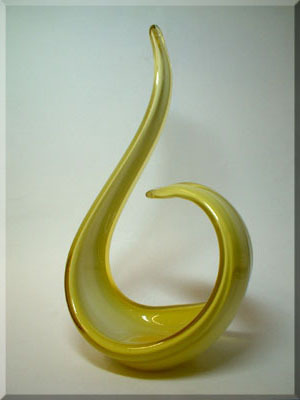 Milky yellow glass sculpture. 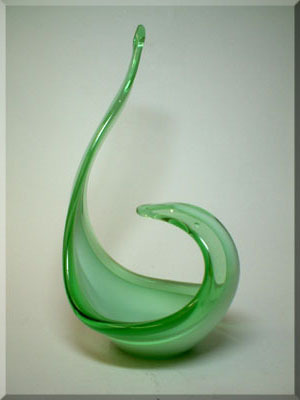 Milky green glass sculpture. Milky purple glass sculpture. 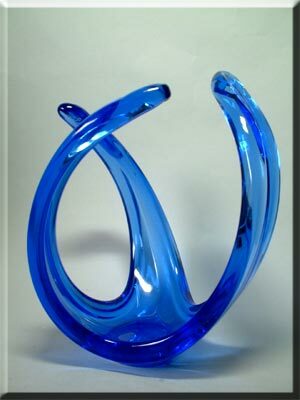 Milky blue glass sculpture. Green glass vase. 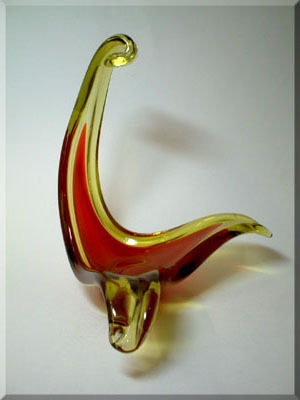 Orange glass vase. Amber cased glass vase with blue + green threads. 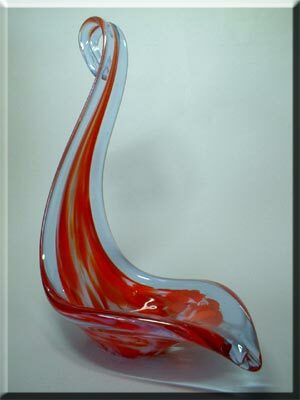 American clear glass sculpture with bright red outlines, made by Pilgrim glass, designed by Roberto Moretti. 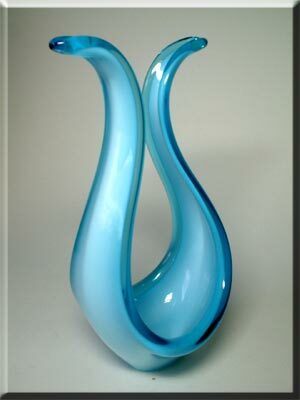 Ref: click here American clear glass sculpture with bright blue outlines, made by Pilgrim glass, designed by Roberto Moretti. 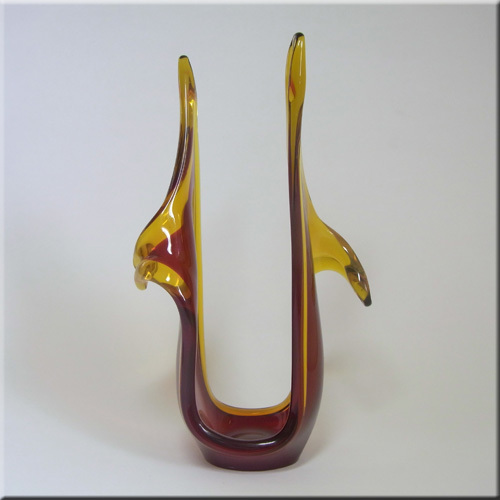 Ref: click here Polish amber pressed glass vase by the Zabkowice factory, designed by Jan Sylwester Drost in the 1960s. Ref: click here Polish blue pressed glass vase by the Zabkowice factory, designed by Eryka Drost, pattern number 6087. Striped glass vases in green, orange and yellow. 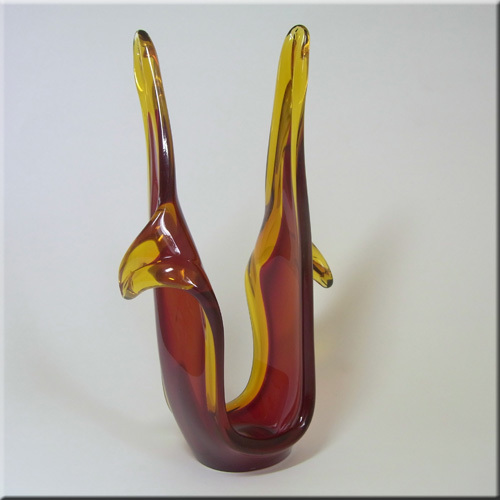 Italian amber textured glass vase, probably made in the Empoli region of Italy. Green + amber biomorphic cased glass bowl. 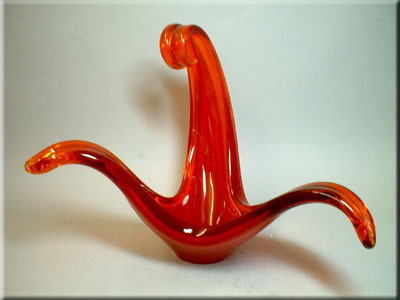 Red + amber biomorphic cased glass bowl. Blue biomorphic cased glass bowl. Blue biomorphic cased glass sculpture bowl. Clear glass basket sculpture with yellow, green + blue threads. Clear glass bowl with yellow + blue threads. Blue biomorphic cased glass bowl. Blue biomorphic cased glass sculpture bowl. Blenko American heart shaped vase, labelled. Green + clear glass sculpture bowl. 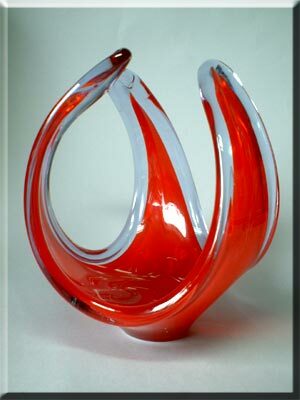 Red + clear glass sculpture bowl. 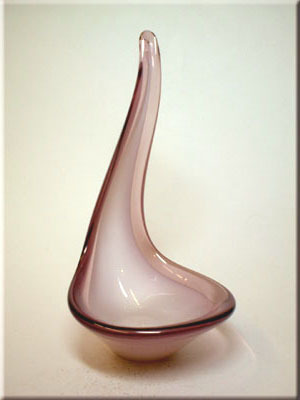 Pink glass biomorphic bowl. Pink + purple glass bowl. Blue glass biomorphic bowl. Pink + opalescent white glass bowl/ashtray. Pink + purple glass 'clam' bowl. Pink + blue glass bowl. Pink glass biomorphic bowl. American opaque hand enamelled shaker by MT Washington. Yellow spikey glass bowl. Blue glass bowl with white speckles. Pink + blue glass bowl. Purple + blue glass sommerso vase. 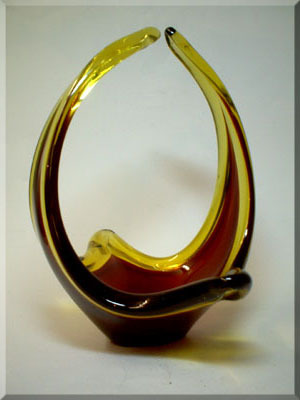 Amber organic cased glass vase.